Next to the research areas A and B the CRC also established four thematic clusters that more comprehensively illustrate the functional significance of extensive cooperation and communication of individual CRC projects. Key players of this project cooperation are our central projects Z1, Z2, Z3 and Z4. Z1 encompasses the structural and financial organization and coordination of the SFB, gender and family support measures as well as public relation matters. Managing coordinator and person to contact in matters related to these subjects is Dr. Isabel Sáez Martínez. 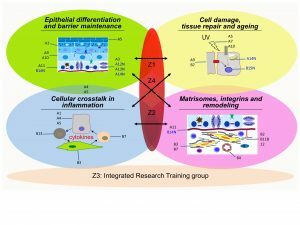 Z2 provides a technical expertise platform on ultrastructural analysis and cell biology. In case of questions related to this service project please contact Marc Peskoller. Z3 is a structural platform to support young scientists. For more information please go here. Z4 is a new service platform on translational research. It provides expertise on histological issues, assists projects with translation of their findings to the clinic and expands the biobank with all kind of available skin disease samples. For questions please contact Dr. Doris Helbig.